The Lazy Web seems not to have taken up the challenge, so I took a crack at it. The solution I came up with is a single-page application, which is just a web page that uses HTML, CSS, and Ajax to do something that’s (hopefully) interesting and useful. It defaults to my Twitter name but you’ll of course want to try yours, and those of others you’re curious about. The first time through, you’ll be prompted to authenticate to api.twitter.com. This looks like the password anti-pattern, but really isn’t. You’re authenticating yourself to the Twitter API in the same way that you normally do to the Twitter website. 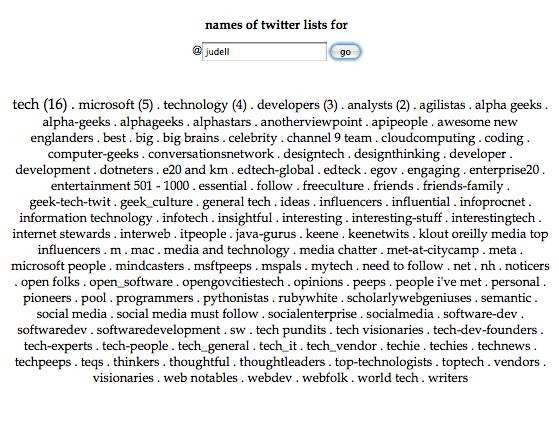 Note that since the API call used to build the tag cloud is rate-limited, queries through this page will be charged against your daily allotment of Twitter API usage, just as when you use client applications like TweetDeck or Seesmic. What will your tag cloud say about you? I don’t think you’ll be surprised. It’s just another of the unique signatures written for us by others. That those signatures do get written, though, and that they can be discovered and read, never ceases to surprise me. The dynamics of single-page applications also never cease to surprise me. In this case, a tiny 4K web page is all that’s delivered from my modestly-equipped personal webserver. It would probably survive a Slashdotting. If not, the page could be hosted on any other server, or on a other local drive, and would continue to work the same way. I’m also using jQuery, in this case served from the Microsoft content delivery network, so that’s unlikely to be a bottleneck. The only real limit is Twitter API usage, and that’s spread across all the Twitter users who authenticate through the page. To my way of thinking, that’s a killer combination. For years I’ve been using Bruce Schneier’s Password Safe, a Windows program that keeps my passwords in an encrypted store. There are many such programs, another example being 1Password for the Mac. This kind of app lives on your computer and talks to a local data store. That means it’s cumbersome to move the app and your data from one of your machines to another. And you can’t use it online, say from a public machine at the library or a friend’s computer. I’ve wanted this solution for a long time. Now I have it: Clipperz. My guest for this week’s Innovators show is Marco Barulli, founder and CEO of Clipperz, which he describes as a zero-knowledge web application. What Clipperz has zero knowledge of is you and your data. It just connects you with your data, on terms that you control, in a way that reminds me of Peter Wayner’s concept of translucent databases. Clipperz is immediately useful to all of us who struggle to manage our growing collections of online credentials, But it’s also a great example of an important design principle. We reflexively build services that identity users and retain all kinds of information about them. Often we need such knowledge, but it’s a liability for the operators of services that store it, and a risk for users of those services. If it’s feasible not to know, we can embrace that constraint and achieve powerful effects.